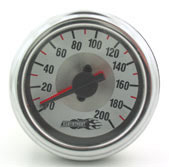 Easy Street 200 psi air gauge dual needle, illuminated, with chrome bezel and spun aluminum center. Dual needle air-gauges like this are what you need for keeping an eye on any two air pressures. For example, you can easily monitor the air pressure in two separate air bags, like both front, side or rear air bags. Each of the two needles work independently of each other and are hooked up by simply running air line to the two ports on the back of the gauge! The large numbers, and many other features, make this style of gauge one of the most popular air-gauges in the air suspension industry. Simple to install! You need high quality air-gauges for your air suspension so that you can have an accurate pressure reading. It is important to have accurate pressure readings to be able to adjust your pressure for ride height or ride quality. That's what having air suspension is all about! You need to know when your custom car or custom truck is high enough to clear the approaching speed bump, or low enough to look good cruising down the strip, or to throw some sparks! That's when high quality air-gauges come in to play. Other sites charge $59.99 for this exact air-gauge! 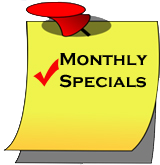 You Save 23% by shopping with us!